One day my guest come home and told to me “Boma…I made a big mistake today cause I eat Mc Donald’ss for my lunch” than I just laugh and told her that she really made a big food mistake here in my town. Hi everyone my name is Boma and thank you for visiting my blog, I live in Yogyakarta since I was 5 and definitely love this place more than my hometown, Jakarta. No matter you are in first time, twice, three times or over but in case you want to visit Yogyakarta I recommend you to read my past article about 7 Freakin’ Awesome Things to do in Yogyakarta within 3 days, it’s brand new article that I made in 2018 and based on my own research related to my most wanted activities that my guest did during their stay in Boma House. Back to the main topic today I’m gonna share you about culinary that you should try if you want to eat like locals. There is always a question about what to eat here in Yogyakarta than I got some super good news or you. No matter where you live try to go to Pasar Ngasem (Ngasem Market) where Plaza Ngasem located, this place is so unique and you will meet how the locals live by selling a snacks, fruits, housing tools and or sure the most authentic snacks and breakfast. Officially Pasar Ngasem is the front yard or Tamansari Water Castle and for sure you must visit our King’s 2nd palace, if you live nearby Malioboro or Kraton than you can walk or ride with becak (the 3 wheels tuk-tuk) to go to Pasar Ngasem, it takes about 15 minutes ride with becak from Sultan Palace and cost about IDR35.000/becak (USD3). What you see below is the Plaza Ngasem, a nice courtyard where you can sit by and enjoying your day. If you lucky, our government often held some art performance in that stage too just like what they did for the FKY (Festival Kesenian Yogyakarta) a.k.a Yogyakarta Art Festival. 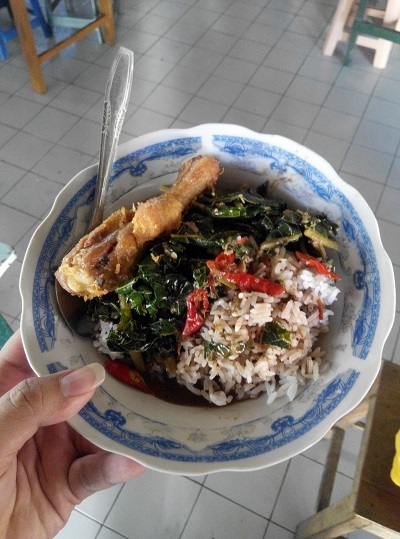 This is what locals eat for breakfast and lunch, it consist of rice, brongkos (sweet-salt dark soup consist of tofu, bean, and egg) and fried chicken, than for another one I got rice, green cassava leave, and sunny egg than another one will be. I pay this awesome food for just IDR12.000 to IDR15.000 each and I ordered a glass of hot tea costs IDR2500, than I feel like in paradise, this all what you need to eat if you expecting eat like locals. I uploading my Yogyakarta travel photos and sell it online, in case you interesting with the photos that you can buy it on shutterstock. Once I got my breakfast done, my wife ask me to go to Apem stall where located only few meters from us. Apem it self is typical local dish made from rice flour, sugar, and coconut milk. It taste sweet and looks like Japanese Dorayaki, the old lady that I meet there begin her Apem business since 5 am and ended at 11 am, she sell this delicious snack for just IDR2500/each or about USD1.5…for me I need 2 or three! How to go to Pasar Ngasem? Here in Pasar Ngasem you will see how people of Yogyakarta live by! 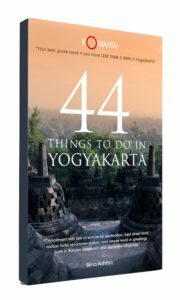 If you interesting in learning more about Yogyakarta, you may check my 44 things to do in Yogyakarta eBook, which include recommendation of attractions, hotel – budget accommodation, bets street food, and simple words to asking help or say greeting both in Bahasa and Javanese language. Have you ever visit Pasar Ngasem before? Share your experience below, I would love to hear from you now!